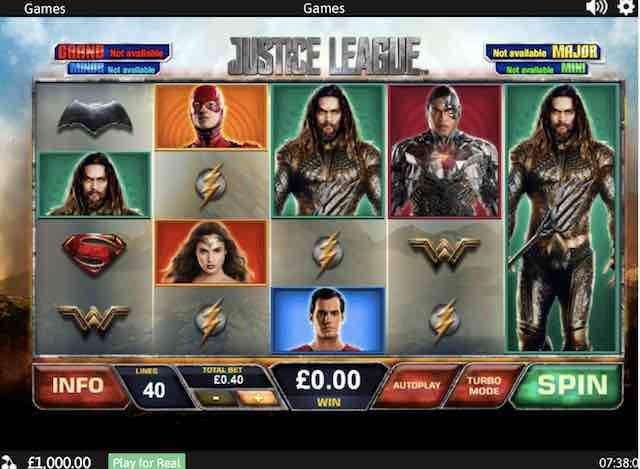 In time for the November release of the blockbuster movie comes Playtech’s Justice League slot game. This studio is no stranger to turning DC comic books into world-beating video slots. Justice League brings together some of the finest characters from the DC range, including The Flash, Cyborg, Aquaman, Wonderwoman, Superman and Batman! With that lot on board, it’s no surprise that this game will set the pulse racing. The highly-volatile, fun in this game comes from the free spins feature – each superhero has one of their own – plus the chance of turning symbols wild in the bonus rounds to push some big wins. There are some pretty big visuals and the soundtrack is bang-on too. There are also four Progressive Jackpots to play for as well. You can play Playtech’s Justice League slot for real of for fun on mobile, desktop and tablet on our recommended casinos, or read on for our full reviw of the game, including an explanation of all the features. 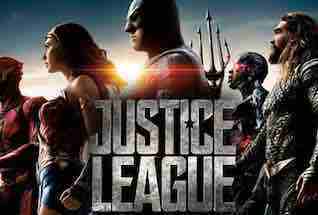 The Justice League game was released at the same time as the film starring Jeremy Irons, Ben Affleck and Gal Gadot. The games theme is an exciting one and reflected in then graphics and animations on the reels. There are loads of stills taken from the movie, and the soundtrack is pulled in too. The symbols on the reels are the logos of each of our superheroes – the low paying symbols – and pictures of each hero – the high paying symbols. Batman is the highest-paying of all, returning 500 coins for 5 in a row on a payline. The superhero symbols can be stacked up to 4 high on a reel to drive bigger wins. You can play Justice League slot from 40p up to £500 per spin. It’s a high volatility game, so beware of this when you are playing – you may experience many dry spins before you even hit any wins, but when they come, the payouts can be sensational. Adjust your stake using the up / down arrows at the bottom of the game screen. You can also set sounds to on / off in the settings depending on your preference. In the base game there is a random re-spin feature that can happen at any time. During the re-spin one superhero will turn wild. The re-spins can be triggered up to 5 times, and all superheroes can turn wild. Flash Free Games – 15 free spins.2 or more scatters during the round gives you another 15. Cyborg Free Games – 12 free spins, and 12 more with 2 extra scatters. Aquaman Free Games – 10 free spins, and any paying symbol landing in the feature frame will turn all matching symbols wild. Wonder Woman Free Games – 7 free spins – and a superhero landing in the feature frame will turn all their symbols wild. Superman Free Games – 5 free spins. A giant 2×2 feature frame comes into play here. Batman Free Games – get 2 free spins. Here, ANY superhero landing in the feature frames area will turn all hero symbols wild. The four progressive jackpots are part of the DC Comics range from Playtech – the one to win is the Grand Jackpot. They are networked with other games in the group. This is a top-class game with some great features. The one to look out for is the Batman one which is highly volatile, but can bring some massive wins with all those stacked wilds coming into play. Beware, and be patient, and you can have lots of fun with Justice League video slot.